My goodness. I think we have a new link to provide all the screaming carebears. If this article--on the official Wiki and linked by CCP on the launch screen--went any further, it would be a copy of the Code. The second-to-last item there really is golden. As for the last item, it's a stern reminder to the carebears, who, as we've seen time and time again, struggle to resist the temptation to make real-life threats. At the same time, a carebear's risk of actually being banned for making said threats is probably overstated. As good as the "Golden Rules" article is, it was missing at least one. To illustrate the Golden Rules and to celebrate the contributions of his good friend John E Normus, Agent loyalanon created a fine video of carebears being executed for Code violations. Look at all those burning freighters who consented to PvP by undocking! As always, permanent links to New Order artwork may be found on the Links page. No my friend, these have always been the rules. 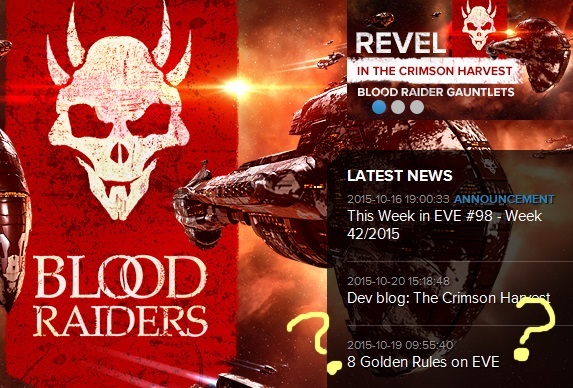 Until CCP makes another stupid decision, I think is what he meant. Yea, I've meant them staying on official wiki and not rewritten to some more carebear friendly tone. "You're in this game for the long haul. Don't expect to do something meaningful in the grand scheme of things in the first day of your first trial account ever." In light of recent events, methinks that one needs a little addendum re: ganking in a catalyst. "If you kill somebody, you won't be able to quit the game. Not even if you stop playing." To be clear, loyal destroyed my 300mil pod during that Hyperion SB gank. Something that went unmentioned, but certainly not overlooked, by the Savior is that even the phrasing of these rules -- not just their meaning -- appears to have been inspired by The Code. As the Savior often says, it's another reminder of the total cultural victory that the New Order is rapidly approaching. Hooray! Can't be made up if it comes directly from the horse's mouth, now, can it? The Evidence of Code-Compliance at the highest levels of CCP is mounting. 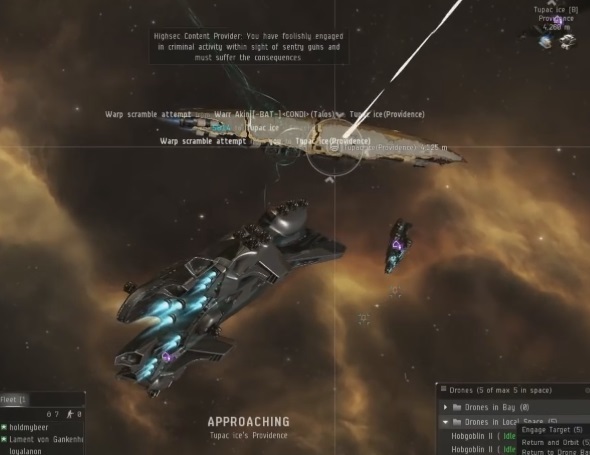 First the suspiciously-timed announcement that ganking doesn't contribute to player loss, exactly at the 3:15:00 mark of CCP Rise's presentation at Fanfest, then the fashionable RL New Order Mining Permits several CCP staff requested and now carry, and now- even the Wiki is changing to officially reflect the words and philosophies invented by James 315. How much longer will it be before CCP comes out and directly says they're Agents of the New Order, and wholeheartedly support the Holy Mission of James 315? I look forward to the day that I witness The Saviour knocking beligerent miners from their belts with His Invincible Polaris frigate. Long windiness is a form bot-aspirancy. Where is your "I'm the smartest ganker in the galaxy" permit???? hmmmm? Duh, it's ALL made up! Eve isn't real!! For every bait that I take, it appears, that four more bite on my comment, yourself included. And to address your second point; no. James 315 has decreed that we shall sell Permits to mine in his space, so that's what we are going to do until He tells us otherwise. And not only this, but the reason that we only kill miners is because those are the individuals that most need to be taught a lesson: EVE is not a game about mining. It is a game about blowing up spaceships. And you don't get a choice not to participate in Player vs. Player combat if you wish to stay undocked. CODE pilots gloss over the fact that the targets they are "winning" over can't possibly resist. I can brag about how I'm the fastest runner in a race, but if I'm racing against a snail, a slug, and some roadkill, being first doesn't mean anything. They can't possibly resist because they have made poor choices, so really their own fault. Yeah man, didn't you read the last Golden Rule on the wiki? "If you lose stuff, it's almost always your fault. Really, only yours. " These miners we kill chose to ignore the Code and be miners. That makes them personally responsible for their death at our hands. Had they not made such poor choices, they would not be dead. It's that simple. They can fit resists to their ship. They can fit tank to their ship instead of selfishly and greedily fitting for yield. They can choose not to mine altogether and choose the path of PvP. And while this choice would not inhibit CODE's activities in the slightest, as we are very, very good at PvP, it would serve to "not make them targets." You say that we are winning over easy targets- those are the targets that need to get hard. We provide the incentive for them to do so, by continually dunking all over their faces. Because we can, because it's right, and because James 315 told us to do so. The Code isn't special. It doesn't "win", because it can't. Following it will not make you safe. People should learn to tank their ships, stay at the controls instead of being AFK, and possibly learn not to stuff lots of goodies in a T1 industrial. This is common sense to me. These things, which are the basics of following the Code, don't make your ship an ungankable fortress, it just makes a gank less likely. CODE pilots claim they're "Elite PvPers". There is no risk of failure. There's no skill required. Literally anyone can shoot these morons and get kills. The CODE pilots that claim this exalted PvP status because they are killing unarmed, untanked, and uncontrolled ships suffer from the delusion that killing what amounts to an NPC target makes them a PvPer. That's the same delusion that afflicts the bling-fit mission runners CODE likes to target. Wow, I think I just proved that CODE is engaged in bot-aspirant behavior. "People should learn to tank their ships, stay at the controls instead of being AFK, and possibly learn not to stuff lots of goodies in a T1 industrial. This is common sense to me. These things, which are the basics of following the Code, don't make your ship an ungankable fortress, it just makes a gank less likely." Isn't this what CODE. is trying to get people to do? Though they're more "shoot first, shoot some more, and when all the bot aspirants are dead, shoot them some more for not learning". It reeeeally does irk you that we're the most elite Alliance in the game, doesn't it? Does this empirically proven fact keep you up at night? It must really irk you that I constantly blow holes in your imagined superiority. Being "Elite" implies that you excel in something that most people can't do at all. But literally anyone can shoot unarmed, untanked, and unpiloted ships. Really, what's elite about that? Please, enlighten me. Please show us your corporation's killboard, so that we may have empirical evidence of your corporation's inferiority to CODE. If you don't do it, that means we win. Again.